Raaga.com: Can Kollywood Superstar Vijay’s PULI outscore Bollywood’s Mega Star Akshay Kumar SINGH IS BLIING? Can Kollywood Superstar Vijay’s PULI outscore Bollywood’s Mega Star Akshay Kumar SINGH IS BLIING? With Bollywood’s top notch producer Pahlaj Nihalani purchasing the pan-India rights for the Hindi dubbed version of Tamil superstar Vijay’s fantasy adventure drama PULI there are speculations that the Hindi dubbed version may give a tough fight to Akshay Kumar’s comedy film SINGH IS BLIING when the two film release this week simultaneously. Pahlaj Nihalani is an experienced film producer and knows the pulse of the audience. A picture of his intellect can be gauged from the string of super hits Bollywood blockbusters that he has produced over the years like AANKHEN, SHOLA AUR SHABNAM, AAG HI AAG, ANDAZ etc. 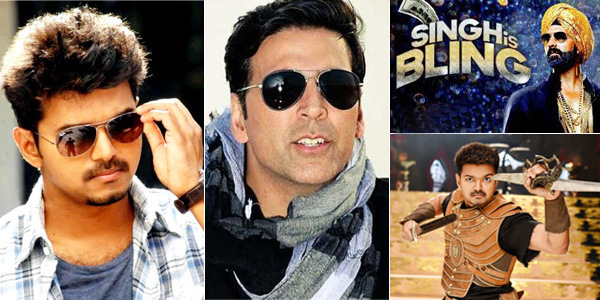 Coming to the star appeal of South superstar Vijay and Bollywood Action King Akshay Kumar, it is obvious that Vijay will have a spell bounding draw in Southern states and foreign countries where he has a huge fan following but will he make an impact in Northern India is a big question. However thanks to the presence of Sridevi, the movie is sure to make a fantastic opening in Northern states too. As regards Akshay Kumar he is sure to pull in audience as the movie is sequel to his early hit SINGH IS KING. Hence the brand value will attract the film buffs but on the negative side the movies trailer looks like a series of jokes patched together and also gives you a massive SINGH IS KING hangover. So readers who do you think will have the big draw? Kollywood Superstar Vijay’s PULI or Bollywood’s Mega Star Akshay Kumar’s SINGH IS KING?? ?